Now, I must admit: at first glance I thought they were kind of cute. Then I realized that the 4 guys in the middle are smoking cigarettes - now what kind of an example is that? Plus, they're all being goosed by what must be uncommonly sharp candy corns: hellooo! cruelty to batty bird creatures! Not cool, man. Not cool. Ok, yes, they're round and have googly eyes, and therefore I must love them. However, what the heck are they made of? Is that really solid icing? Please, Michele L., tell me that's not solid icing! What'd they do, ice the things with an ice cream scoop? Obviously, Jen, you are not a Food Network devotee...how do you think we get smoked turkey? Please, Michele L., tell me that IS solid icing!!! i kinda wanna take the first ones home and nurse them back to health or rehabilitate them or something. they have obviously been huffing the fumes from the post-pumpkin-pie empty reddi whip cans, and could still be properly reintroduced to society after a long, hard detox. and a few chantix for the smokers in the middle. the others... i thought they were nilla wafers at first glance and thought "well, that's kind of oroginal, i suppose", then upon clicking saw the spherical icing. now i can only hear homer simpson saying "mmmmm... brown balls of frosssstiiinng *drool sound*" when i look at them. are those BAT wings left over from Halloween?? I think those are upright cookies on the second photo. I think those are cuter than the little piles o' poop with eyes in the first pic. amazing! the first ones look like flying dog poop with eyes, and yet are kinda cute, whats up with that? Yup. Ice cream scoop. My favorite icing tool. I would love to serve demented looking turkey cupcakes at my Thanksgiving feast! BTW - just discovered this blog last night and laughed so hard I had to walk away from the computer! I knew eventually someone would make a turducken cake. Could the "icing" in the bottom photo be some kind of chocolate mousse type situation? It definitely looks scooped, I'll give you that. Keep the cute/wtf's coming, or I'll have to go back on Prozac. Let's hope on that last one that those are scoops of a mousse or something. It definitely isn't an upright cookie. My sugary senses are tingling and telling me that is precisely a scoop of icing on that cupcake. I think I am going into a diabetic coma just looking at it. I think the second ones look more like turkey butts than turkey fronts. Big, smiling turkey butts. Again with the drooling Homer Simpson, "Mmmm, Turkey Butts...."
the second ones would make really cute ice cream cupcakes! must experiment today! Could have been a moose and mousse post dontchya know. The first ones all look okay, except for that poor guy in the front on the left. Looks like he ate too much stuffing. And in the bottom one, I'd agree that it looks like a scoop mousse. It can't be a cookie because the candy corn is sticking into it. They look magically delicious, though. But seriously, between all the pie, who the hell would have room for cupcakes or cake at Thanksgiving? Ahahaha those DO look like turkey butts!! Maybe they're wearing smiling bloomers. Awesome blog ! Thats why it's become a blog of note! I thought this was so funny. I saw your link on another blog and thought I'd start reading it. I read the latest post and thought it was funny. Thanks for sharing. I believe thosse first ones are actually tiny little Cthulhus. Don't be fooled by their brown coloring. They're little tiny Great Old Ones. The second ones .. wow. I mean, I looooove me some icing, but just .. wow! The ones in the first picture look like Mister Potatohead. Does the one on the left have a mustache? This is Michele, and yes, yes that IS solid icing...just ups the ick factor doesn't it? Wait, you mean you don't make your frosting that way? Word verification: stoplogi. I don't know who logi is (perhaps one of these decorators? ), but he or she must be stopped. I like the first batch. They're all plumped up for Thanksgiving. It's called "Quick, use up all the leftover Halloween candy on these Thanksgiving cupcakes before Santa sees it!" Some bakery counters should have a local dentists business card taped right on the cake box. The second one looks like the turkeys neck is being pulled out of it behind!!! EEK!!! I'm with Nissa, those are turkey butts smiling at me. i can always count on your blog to give me a laugh or pick me up. that's exactly what i thought today, "i need a good laugh. 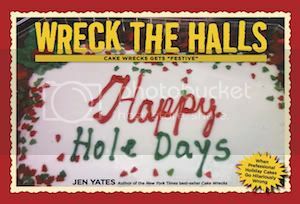 let's go check Cake Wrecks now." THANK YOU! My husband insists the back one in the left column of the first picture is a walrus. A winged walrus. Those look like truffles at the bottom. Lol! Maybe even mousse. And the candy corns, wiseguys, as you well know, are turkey feathers. All in all, I found the first turkey cupcakes to be a Cake Success, not a Wreck. What the heck are those yellow things hanging from the turkeys' beaks in picture #1 supposed to be anyway? #2 is what happens when you drop a plump, farm-bred turkey onto concrete from the top of a 5-story building. No idea why they'd all be smiling about it though. And, SOLID icing? I can feel my teeth rotting just thinking about it! The second ones look like a scoop of tuna salad to me - I 'd rather it be the icing! I think those cupcakes would scare the crap out of little kids. cute....if it were a kindergarten lets decorate a cupcake project.... not so much for something being sold by a "professional"
Curse of the melting bat chickens! Makes me feel bad for them.....tell me that stuff is NOT icing! I so agree with Nissa! I thought the second picture looked like turkey butts too! I love those cupcakes! WOW! Does anyone else consider that the "feathers" on the second batch look like rotten, yellowed teeth? Teeth, in fact, that fell out of previous customers' mouths when they attempted to eat a solid ball of icing? Mmmmm solid icing... my favorite. The cakes are kinda cute, even the turds with wings. wvotd..bersing "after I eat a whole can of Betty Crocker icing I'll be bersing at the seams"
According to my 4 year old, and I quote, "Those turkeys have faces on their bums!" 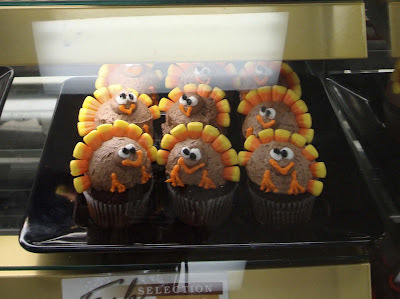 Is it just me, or are turkeys a prime target for Cupcake Cakes? This aren't too bad... but next to the electrified squrriels how can melting chicken-bats hope to compare? I'm hoping to make a couple of extra dollars in the next fews weeks and I can only hope I'll manage to pick of some of my local store's newest wrecks... they've got something that looks like two brown blobs with gunshot splatter coming out of the back that is suppose to be a turkey... and they've gotten really into making these bizzare cyclops cupcake creations that I can't even explain. We don't have candy corn, or Thanksgiving for that matter, in the UK. The smoking bat cakes get extra points for trying to reproduce in icing that disgusting piece of flappy red flesh hanging off the Turkey's beak, which I believe is called a snood. Turkey cupcakes from the funny farm! If in the top pic the four guys in the middle are smoking cigarettes, the guy on the front left side has a big old stogie in his beak. They look like whole turkey lettuce wraps. At about the same time my eyeballs were registering greasy spheres of industrial shortening-based frosting, my brain processed your text. Yep! I'd say your guess was spot on. I'm horrified at the same time imagining exactly how it would feel/taste. And *hides face* liking it. That first batch looks like it has moose antlers! I'd be all over that scoop of icing. Srsly. Last night we hit the grocery store for emergency supplies (cat litter and wine) and I had to peruse the cake case. My husband snarked that I just had Tiramisu at dinner and I barked back that I wasn't buying a cake I was looking for something for Cake Wreck! Nothing too wrecktastic except everything was really pastel overload considering it's fall and all. Oh and a TIP for wreckporters. Most grocery bakeries don't have staff after certain hours for the night. Easy peasy photo timez! Please tell me that IS solid icing. Yummy! Plus. If you had a kid who likes to pick off all the eyes, candy parts first, you'd be left... with what looks like a steaming pile of poop. What's the with eyes!? Are they Turkeys with the Bird Flu or something? perhaps a "cake ball", the latest trend for showers, etc. in the interest of fully understanding what, exactly, we're looking at...i think the ones in the first photo are NOT smoking, i think they've got candy corn for beaks, and the white tip makes it LOOK like smoking. plus the flappy snood thing mentioned already. I'm so much of cake lover that i'd eat any of these. Now, I might have my eyes closed when I do it, but I'm still eating my piece. I'm just convincing myself it isn't solid icing but chocolate-chocolate ice cream.